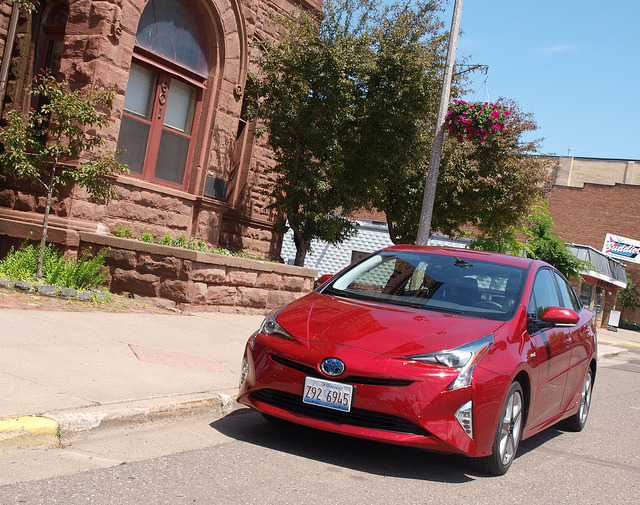 As I was preparing for the arrival of this “Ride Review” vehicle subject, I looked back at our archives to see what was said about the Toyota Prius. Interesting enough, a poll was taken back in 2012 as to which vehicles represent the GLBT community. 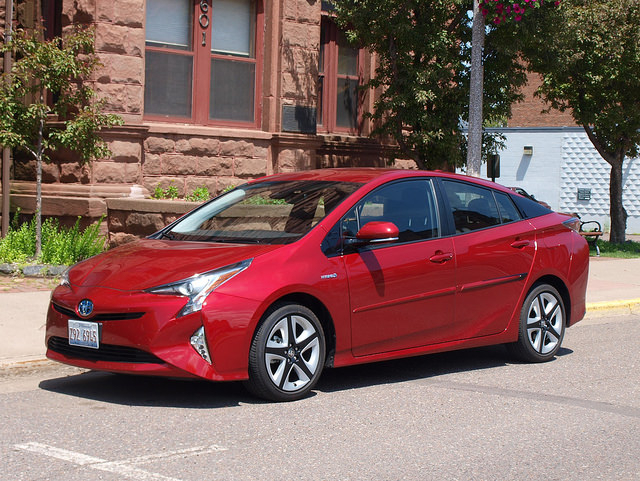 Sure enough, the Prius was among the top 10 listed, thanks to your feedback. Four years later, we still love the Toyota Prius. It seats four to five people, offers good cargo capacity, sips fuel like no other vehicle on the road and emits almost no emissions into the air. For 15 years, Toyota presented this alternative vehicle as the future of the automobile. Who knew it would become as popular as it has been since? Toyota presented its fourth generation Prius last September in Las Vegas in spectacular fashion. It was a debut that no one would associate with a champion of the environment. Then, the commercials started airing. Toyota had the Prius play both a cop and a robber in a wild highway chase. In all, Toyota wanted to drive home the fact that this is not the Prius we used to know and love. Granted, it works the same. Yet, this new skin, interior, and the addition of double-wishbone suspension says otherwise. But, how different is the new Prius than any generation before it? Right off the bat, the Prius is designed to disturb the universe. It will disturb your “old” Prius. The car is lower in stature, more sporty and athletic, and exhibits a set of lines designed to entertain the eye. The front end sports an evil grin, though not as wide as a Cheshire Cat. The headlamps are designed differently for a more directed array of outward lighting. On this Four Touring (the top model of the 2016 Prius line), its fog lamps are more integrated into the front clip. The body still speaks “hatchback,” but with a sleeker profile. Missing is a pane of glass in the C-Pillar seen on the last two versions of the Prius. Instead, there is a black accent piece to bridge the roof with the beltline. Glass area is longer to minimize blind spots. The hatchback still has a split glass pane, broken up by a protruding spoiler break. From the inside, the optical illusion shows a less distorted view, even with the fastback-like roofline. Perhaps the most controversial part of the exterior design is the rear end. Partly influenced by the Mirai fuel cell vehicle (sold only in California), the Prius sports an unusual three-dimensional tail lamp design framed by a clear plastic housing with multiple lenses framed within a boomerang-shape housing. My automotive history Rolodex tells me that Toyota was hoping to bring back the tailfin design of the late 1950s to early 1960s. Maybe I am exaggerating, but it was one of the things I thought of at multiple glances. This may not be the feature you will love, but it can start conversations quite easily. If there is one thing that may cause further debate it is the use of the seventeen-inch, five-spoke aluminum wheels with black trim on the rim and inside the spokes. This is a new fashion statement that is starting to permeate in the newest automobiles. They’re different and finish off the look designed to make the Prius stand out more than before. And, yes, you will stand out in this Prius. When you step into the Prius, there are a few shocks to what was familiar in this vehicle. The center high-positioned instrument cluster has switched to a wider TFT screen with excellent graphics and an abundance of information. An information center offers more than before, including fuel economy history and tracking, and the usual screens still exist, such as the energy transfer map and power rating indicator. On the Four Touring model, there is some white gloss trim to go along with the black upholstery and main interior space. The white contrasting trim is actually quite cool. Dominating the middle of the instrument panel is a center stack pod crowned with a seven-inch diagonal Entune touch screen. In this model, Bluetooth connectivity, navigation, SiriusXM, and Entune App Suite access are included. There is a QI wireless mobile charger also included in the Four Touring model. The standard six speakers emit great sound throughout the cabin. This Four Touring model offered SofTex upholstery that is slicker than real leather, but environmentally friendly. Front seats offer some side bolstering, but the cushions need more thigh support. Yet, these seats proved to be very comfortable for longer trips, such as our big shakedown drive we took up to Duluth, out to the Upper Peninsula of Michigan, and back through the forests of Northwestern Wisconsin. There is plenty of room in the back, although anyone taller than six feet would have some challenges for headroom. Rear legroom has improved tremendously. Our model came with all-weather mats that included a huge leaf that the Prius uses as a secondary logo for its lineup. Cargo space is expandable to 27.4 cubic feet with the rear seats down. With the seats up, there is plenty of security for your goodies with a cargo net and a removable sliding cargo cover. Since 2001, the Toyota Prius has been solely powered by a gasoline-fueled internal combustion engine and electric motor combination known as Hybrid Synergy Drive. For the fourth generation Prius, the four-cylinder gasoline unit is 1.8 liters, which puts out 95 horsepower and 105 pound-feet of torque by itself. The electric motor adds another 71 horsepower and 120 pound-feet of torque to the mix. 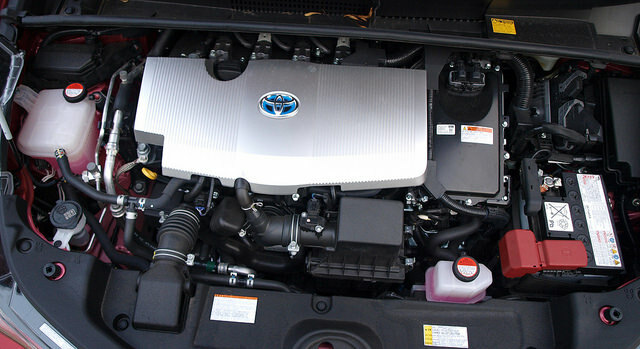 Toyota advertises a net horsepower rating of 121 between these two power sources. You can switch to four drive modes: Normal, Eco, Power, and EV Only. This system is connected to a Continuously Variable Transmission, sending power to its front wheels. Toyota has been improving the response with the Hybrid Synergy Drive system, where throttle lag has been minimized and power source transition is no longer felt inside the car. In fact, it is a pretty balanced performer on the road and in the city. You can put regular gas into a 11.2-gallon tank, while the electric motor draws from its Lithium-Ion pack. The overall result is a fuel consumption average of 51.9 MPG, which is right at average according to Toyota. The Prius hatchback has always exhibited a solid ride and good handling characteristics. The biggest complaint about the driving dynamics of the Prius was the lack of engagement. Toyota went back to the drawing board and installed a double-wishbone rear suspension. The result is an engaging car with a smooth, absorbent ride and excellent handling. The Prius corners near flat through the curves, which would also put some smiles on the faces of enthusiasts. The electric steering system, however, felt very artificial. Though it would seem you can make tight maneuvers, there was a lag in doing so and wider than expected turns were executed. Otherwise, it felt just fine out on the road. On-center feel was OK with minimal play at the wheel. Toyota did work on the braking feel for the Prius. The lag in braking response with the regenerative system was eliminated, which made for good stops in normal and panic situations. Choosing the top Prius model adds the Toyota Safety Sense package. Active safety features included in this tester were a Pre-Collision System with Pedestrian Detection, Lane Departure Alert with Steering Assist, Auto High Beams and Full-Speed Dynamic Radar Cruise Control. Blind spot monitoring, reverse camera and rear cross-traffic alert round out one of the safest Priuses ever offered. If you are serious about getting the fourth generation Prius, you can start off with a basic Prius Two model. The base price for that model is $24,000. Our top of the range Prius Four Touring tester came with a sticker price of $31,827. If you have a Prius and love it, then you might want to think about this new one. The feedback has been mixed on the exterior styling; however, if you can overlook that element, the rest of the car is absolutely good. It is worth driving to see where Toyota went to work on vehicle engagement and the integration of active safety onto one of their most important products. 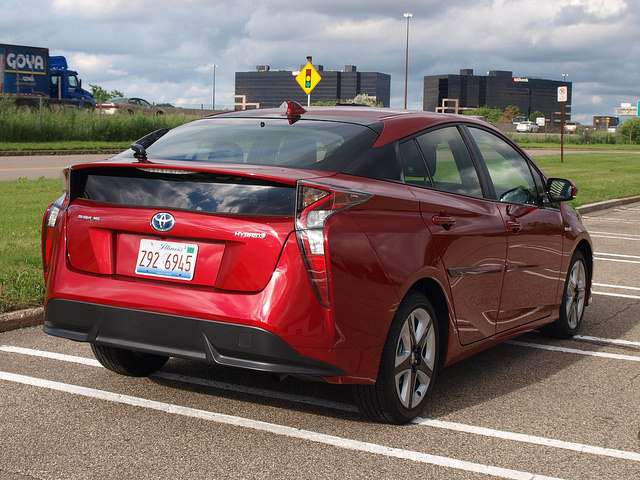 The 2016 Toyota Prius is far from the car you currently own and love. Sure, it works the same, but almost everything else is different. And, in this case, different is good! It may become your new favorite car.